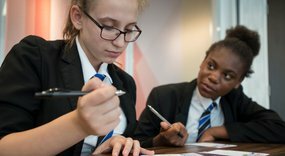 Abraham Moss Community School in Manchester has developed a whole-school approach to embedding literacy across all aspects of the curriculum. The success of this approach has been demonstrated in both student achievement and Ofsted recognition. Our Secondary School Adviser, Catharine Driver, visited the school and met with Literacy Coordinator Hannah Issa to discover more about the key elements of the school’s literacy strategy.